Craig Grady reports: Half term was coming up, we were looking for something to amuse the kids and so we decided to visit Balamory. For those who have no idea Balamory is a kids’ TV programme based in a fictional town on a Scottish island. 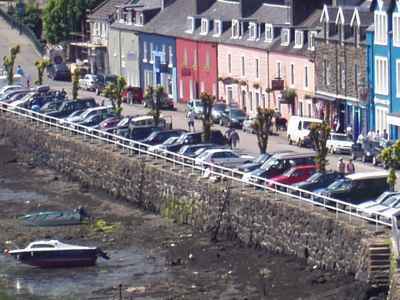 It is actually set in Tobermory on the Isle of Mull. It would have been called Tobermory but for the Womble of the same name; they thought it might confuse the older watchers of children’s television. We left East Yorks on Bank Holiday Monday afternoon and drove up to stay with a friend just outside Carlisle. We thought this would be a good breaking point for an 8hr journey with two small children. (We spotted a campsite at Tebay services beside the M6, for people wishing an overnight stop on route). The Tuesday morning we set off for Scotland, the weather in Carlisle was superb and less than 30 mins later we crossed the border into Scotland, the land of four seasons in a day. The torrential rain at the border was short lived and followed by murky grey skies until we passed Glasgow. We stopped for a coffee and a stretch at Luss just off the A82 on the banks of Loch Lomond. This is a lovely spot with plenty of picnic seating, toilets, burger bar and shop selling superb Scotch pies. After this we had to press on for Oban and our Ferry. We left Carlisle at 8:30 and arrived at Oban at 1:30 with an hours break at Luss. If you are considering going to Mull, then I would advise you to check/fill up with fuel in Oban. We travelled down the east side of the island along single track windy roads with extreme slopes and stunning views, the Bongo handled these superbly, although I felt the need to select low gear and hold to get up the very steep half mile climb out of Tobermory. About 5 miles west of Salen on the B8073 we found a small camping area at the side of the estuary, it had no facilities although toilets were available as was water at a local saw mill 200yds away. It was however incredibly tranquil and beautiful and remarkably cheap at £5 per night and you could have a campfire, this added to the sea breeze should help keep the midges at bay. We actually stopped at the big site at Craignure on the last night, the facilities are superb but I felt it was very expensive at over £20 per night. The sea breeze helped with the midges here although as soon as it calmed they were back. There are two other campsite that I was made aware one was at Fishnish and was a nice looking site with good facilities. The other, which was a verbal recommendation was at Fionnphort in the far south of the Island and was on the waters edge with tremendous views although no electric hook ups. The family who recommended this were from Hampshire and had loved this site. On the way back we had a couple of nights at the Keilder forest campsite, which was located and equipped wonderfully and had lots to do all around it although the midges were still a bit of a nuisance. The bongo covered over a thousand miles in a week and as is usual performed faultlessly and returned over 30mpg. If anyone was considering going to Mull, I would give the following recommendations. 2) Allow plenty of time for journeys on Mull, as all the roads except about 17 miles are single track with passing places. 3) If possible book one night at a time so you are free to explore the island. 4) Visit Aros park just outside Tobermory as it is a fantastic place to spend a day. (some campers appeared to be camping here but I don’t know if gates or toilets are locked. 5) Pre book ferry crossings as some are always full and while your tickets is valid for any ferry you will only be put on after those who have reserved a space. There is no charge for reserving a space. Overall it was a great Bongo trip and I will visit again (probably at Easter) and will allow more time so I can spend some time in Oban as it looks really nice as well. I was also pleasantly surprised to see a blue Bongo heading towards Mull as I headed home (looks aghast).